Born Andrew Warhola in Pittsburgh, Pennsylvania to an impoverished immigrant family, Andy Warhol became an icon of the Pop Art movement and one of the most prolific artists of his time. Though he suffered from physical ailments throughout childhood, he went on to study fine arts at the Carnegie Institute of Technology and shortly thereafter moved to New York in 1949. His career in commercial illustration took off creating whimsical designs for Glamour, Vogue, Harper's Bazaar and The New Yorker magazines. In the early 1950s, he began exhibiting his work in the city and received his first solo show at the Hugo Gallery in 1952 featuring his earliest depictions of actress Marilyn Monroe. The 1960s ushered in a wave of his iconic work pioneering the dialogue between high and low art. His screen printed, painterly images established his reputation commenting on popular culture with subject matter including celebrities, politics, advertisements, and parties. In 1964, Warhol rented a studio that became known as “The Factory” where his work was mass produced by a team of assistants. During the middle of the decade, Warhol focused on filmmaking and performance art, creating approximately 600 films. He later collaborated with musicians including The Rolling Stones and The Velvet Underground, published several books, produced televisions shows, and founded Interview Magazine in 1967. After experiencing a near-fatal shooting at The Factory, he became more reserved and his body of work shifted into commissioned portraits, and in his final years he focused on religious subject matter. 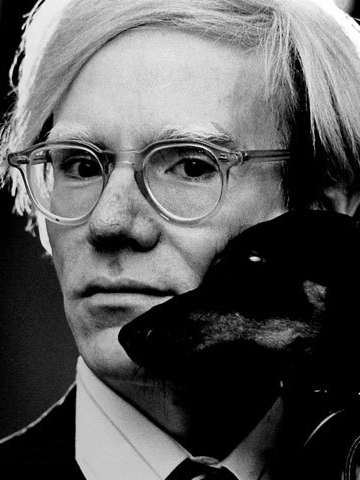 Andy Warhol died in New York City in 1987 after facing postoperative complications. A few years following his death, The Andy Warhol Museum was opened in Pittsburgh and in 2002 Warhol’s achievements were honored with an 18-inch stamp issued by the U.S. Postal Service.